If you have a Raspberry Pi then you are probably going to run a web server on it. You have a couple of options, but I found that Nginx runs like a charm and is super easy to setup. If all you want is to serve up static files then you can wrap up there. But considering you have a Raspberry Pi, you probably also have some interesting projects that will require dynamic pages and probably a database. Enter PHP and SQLite. Follow these steps to get your environment up and running in no time. The first thing you want to do is make sure the apt-get repositories are updated and everything already installed is upgraded to the latest version. So run line below first, it may take a while depending on your Internet speed and how many upgrades are needed. Remember to answer yes when it asks you if you want to install the program. Check that the server was installed properly by first starting the server and then in a browser type in the address of your Raspberry Pi, http://<address_of_your_rpi>. The server isn’t setup to look in this folder yet. You will first need to create a new site configuration in the sites-available folder. Open up the file and add the following lines into the file. The server still isn’t using the new settings yet. Ok, now your Nginx server is setup to server static files from the folder /var/www. Try it out by placing a html file in the folder and writing down the address in a browser. Want more information on you to configure the Nginx server? Check our their wiki. Do you want to make your server more secure? Here are some tips. 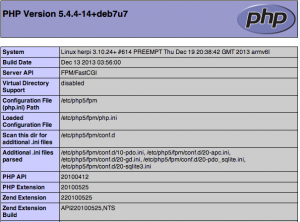 Nginx isn’t configured properly to use PHP5 yet. Go back to your server file created in the previous step and make the following updates. Save the file and restart nginx. Test that everything is working by creating a file called test.php with the following content. Remember this is SQLite3 not SQLite2! There’s a difference. Below is some code you can run to test that SQLite3 is installed and working with PHP5. Download and unzip the the file ‘sqlite-shell-osx-x86-XXXXXXX.zip’, where X is for the latest version. Move the sqlite3 binary file to /usr/bin/.